Ergonomic Blow Gun, PSH-7: Ergonomically designed blow gun, housed in tough and durable engineering plastic. It is fitted with lever to reduce operator fatigue and noise levels. PSH-7 can be used with any blow nozzles to achieve maximum possible productivity and cost saving..
Compressed air is the most expensive utility in an industry, to l earn more about the cost of compressed air and how GIPL products can help you to save cost,click here. 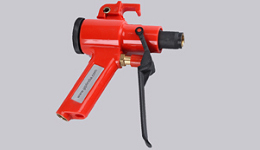 Ergonomic Blow Gun, PSH-7 can be fitted with High thrust nozzle, Adjustable blow nozzle, high volume - high penetration blow pipes. If your work area require very wide and high volume blow, eX blow gun is best choice.